Asclepias curassavica is native to South America and is somewhat frost tender. It grows to approximately 3 feet in height and width. They should be grown in well-drained soil in full sun. This species has narrow 6 inch long lance-shaped leaves. Butterfly Weed flowers from spring to late fall with clusters of bright orange-red flowers that are followed by seedpods 3 inches long with a spindle shape. 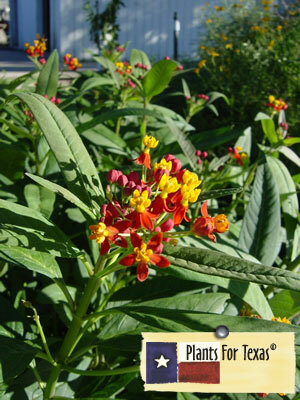 This plant readily self-seeds and is very popular for attracting butterflies. Asclepias curassavica is part of our Plants For Texas® Program, meaning it was Texas Grown, Tested in Texas to perform outstanding for Texas Gardens. Attracts Butterflies!